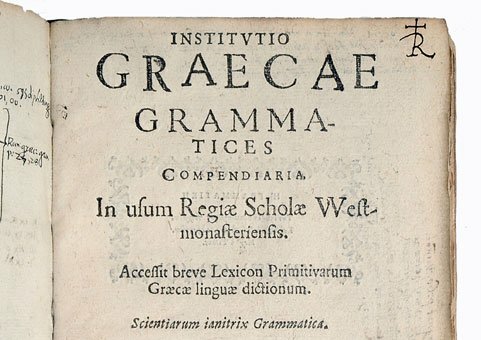 In an earlier post I bemoaned the lack of a fully digitized school grammar of ancient Greek, and kvetched that the existing Greek grammars digitized at Perseus lack something important, namely, the English index to those works. The index is how most of us consult Greek grammars, and this lack, combined with an occasionally dodgy search capability in Smyth apud Perseus, made it seem desirable to fully digitize a good Greek grammar, including the index. We chose one that is I suspect much better for learners than Smyth, and now I am proud to say that it is done and up. The content, with its judicious selection of detail and clear explanations, shows the dedication of a gifted teacher. The original scan came from the Internet Archive. Our version was created in 2013­–2014 with support from the Roberts Fund for Classical Studies and the Mellon Fund for Digital Humanities at Dickinson College. Bruce Robertson of Mont Allison University performed the OCR using Rigaudon, the output of which is available on Lace. At Dickinson the OCR output was edited and the XML and HTML pages created by Christina Errico. Ryan Burke created the web interface, and Meagan Ayer edited and corrected the HTML pages. The content is freely available for re-use under a Creative Commons Attribution-ShareAlike license. I hope you can find some use in it. Each section is given its own page, which results in widely different lengths of pages, and also sometimes some inconvenience when a single topic is covered over many chapters. On the other hand, we included page images at the foot of every page to allow you to look over several chapters at once, and also to check the accuracy of the transcription. The pages are also available as XML. Page images are available as clickable thumbnails at the foot of the page, and there is a link to an XML version. Navigation is via the English or Greek index, by chapter, or by full text search. Megan Ayer made a few alterations to the original text. She corrected small typos, clarified abbreviations, and created tables in html with unobtrusive color coding to aid in readability. Shading aids readability of tables. Another nice feature is the verb list, a quite extensive list of principle parts, with hyper links to further discussion elsewhere in the book. The font, New Athena, was likewise chosen for readability. Normally we would have used Cardo, but the issue with the character “rho + rough breathing” in Cardo has still not been resolved. We made the decision not to put this content into Drupal, essentially for reasons of cost. I see the desirability of a Drupal-based Greek grammar, and someday we may be able to achieve it, but for now it is straight html. Though the content has been carefully edited, there may be errors or infelicities, and I would be most grateful to be notified. Please comment here if you have suggestions, or shoot me an email. 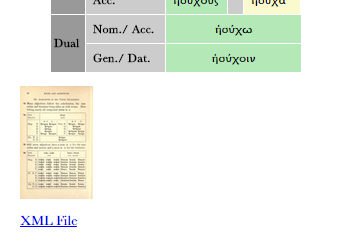 Perseus digitized some Greek grammar resources early on (see below), but since then more has become available in .pdf form from thanks to Google Books and Archive.org. This survey for some reason does not include scans of books. 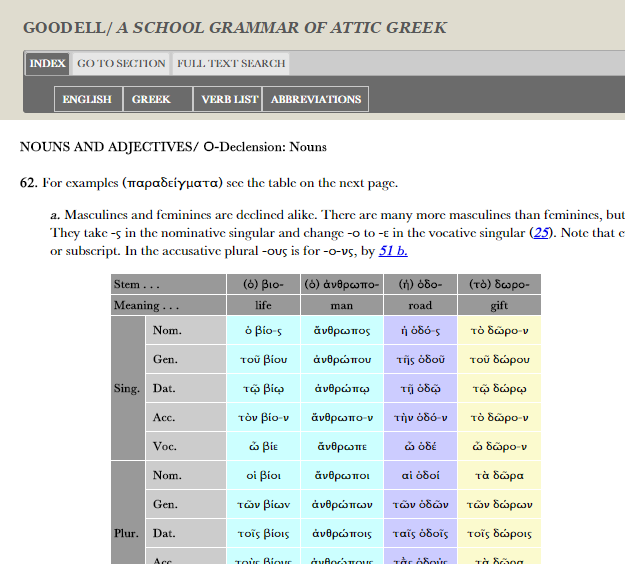 One need in my view is for a good searchable school grammar of ancient Greek. The searchable ones currently available are of the more systematic variety, and are potentially bewildering to students and non-expert readers. Smyth and his 3048 chapters is not for everybody. The best choice in English in my opinion would be Goodell (see below). This spring DCC will be embarking on a project to digitize it properly, making it searchable, and integrating it into the notes of our forthcoming Greek commentaries. This will be done with crucial assistance from Bruce Roberson at Mount Allison University, and Rigaudon. Another problem with the existing Greek grammar digitizations at Perseus is that the indices have not apparently been included. The index, as anyone who uses the print versions of these books will be aware, is the primary way that we consult these works, and not having the index amounts to a serious impediment to usability. Our Goodell will be browse-able via the index. And we are almost finished with a modification of the Perseus XML of Allen & Greenough’s New Latin Grammar that includes the index. We hope to make an index-browseable A&G available early in the new year. Ok, here are some Greek grammars. Let me know your favorites, and if you think I am misguided in my love of Goodell. 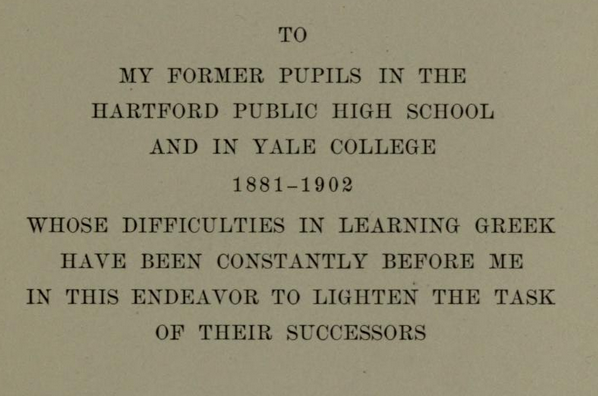 Goodwin, William W. Greek Grammar, revised and enlarged (Boston: Ginn & Co., 1896). Google Books. Hadley, James. Greek Grammar for Schools and Colleges, revised and in part rewritten by Frederic De Forest Allen (New York: American Book Company, 1912) Google Books. Meyer, Gustav. Griechische Grammatik, 2nd ed. (Leipzig: Breitkopf & Härtel, 1886) at archive.org and at Google Books (and another). Monroe, D.B. A Grammar of the Homeric Dialect (Oxford: Clarendon, 1891) at archive.org. Kühner, Raphael, Friedrich Blass, and Bernhard Gerth. Ausführliche Grammatik der Griechischen Sprache (ed. Ildar Ibraguimov, Hannover und Leipzig, 1904).